Tansies, Mugworts, Ox-eye Daisies and Mayweeds. Tribe includes the following genera. 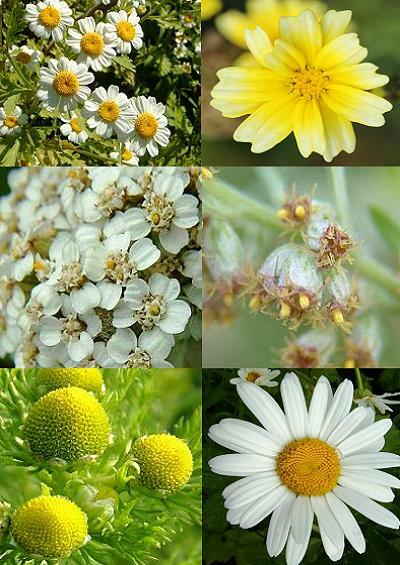 Achillea, Anthemis, Argyranthemum, Artemisia, Chamaemelum, Chrysanthemum, Glebionis, Leucanthemum, Matricaria, Tanacetum and Tripleurospermum. Golden-rods, Daisies, Michaelmus Daisies and Fleabane. Tribe includes the following genera. Aster, Bellis, Callistephus, Conyza, Erigeron, Solidago and Symphyotrichum. Cudweeds and Fleabanes. Tribe includes the following genera. Filago, Gnaphalium, Inula and Pulicaria. Ragworts, Groundsels, Colt's-foot and Butterburs. Tribe includes the following genera. Doronicum, Farfugium, Ligularia, Pericallis, Petasites, Senecio and Tussilago. African Veldt Daisies and Marigolds. Tribe includes the following genera. Calendula and Dimorphotheca. Ragweed, Marigolds, Bur-marigolds and Sunflowers. Tribe includes the following genera. Ambrosia, Bidens, Coreopsis, Cosmos, Dahlia, Echinacea, Gaillardia, Galinsoga, Guizotia, Helianthus, Rudbeckia and Tagetes. Hemp-agrimony and Flossflower. Tribe includes the following genera. Ageratum and Eupatorium. Thistles, Knapweed, Cornflowers, Saw-worts and Burdock. Tribe includes the following genera. Arctium, Carduus, Carlina, Carthamus, Centaurea, Cirsium, Cynara, Echinops, Galactites, Onopordon, Serratula and Silybum. Lettuce, Chicory, Nippleworts, Cat's Ear's and Ox-tounges. Tribe includes the following genera. Cicerbita, Cichorium, Crepis, Hieracium, Hypochaeris, Lactuca, Lapsana, Leontodon, Mycelis, Picris, Pilosella, Sonchus, Taraxacum and Tragopodon. Treasureflowers. Tribe includes the genera Gazania.